Dig Dug download. 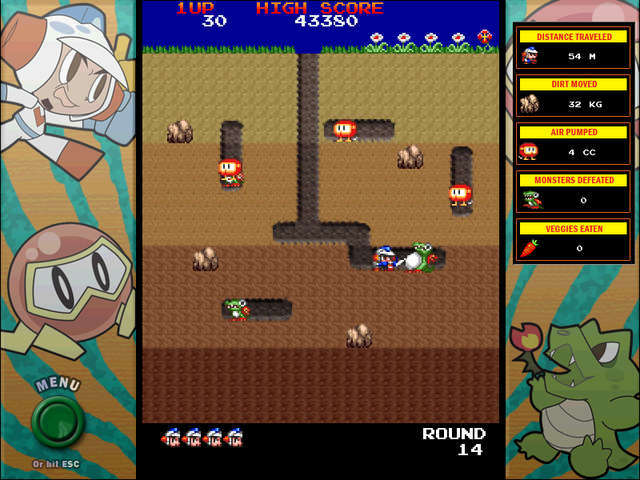 Free download Dig Dug game. 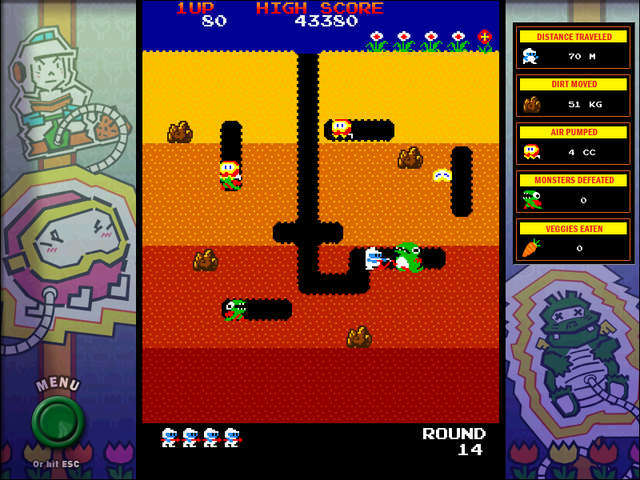 Get ready to pop some Pookas and face down the Fygars in Dig Dug! Play Classic Arcade mode, a faithful version of the original Dig Dug arcade game you know and love, or check out the new Enhanced Mode with updated graphics and sounds. Play through all 256 dirt-digging levels and test your skills with all new stats. Snare your enemies with your trusty pump and inflate them until they pop! Who said landscaping was easy? Dig tunnels underground to find and get rid of the enemies by either inflating and then blowing them up or loosening rocks to fall on their heads! Defeat all the enemies on the screen in order to proceed to the next round. Watch out for Fygars (the green monsters). They breathe fire that can get DIG DUG from afar and through dirt. Fygars can only breathe fire horizontally. Enemies are worth more points if you blow them up at lower depths. A vegetable appears if you drop two rocks during each round. The more rounds you clear, the more points the vegetables are worth. Pressing an arrow key or moving the mouse will move DIG DUG in the corresponding direction. Throw the harpoon by pressing the Spacebar or clicking the Mouse Button. When the harpoon has hit a monster, use the pump to inflate it by pressing the Space-bar or clicking the Mouse Button. Enjoy the classic Dig Dug game! We have no player reviews for Dig Dug yet.